The Style Guy has gone to work for a living. If this comes as a shock to you, imagine how I feel. I haven't actually gone to an office daily outside my domicile for…well…generations. But here I am, once again encorporated, and I'm a boss. It is a bit strange, but it's a little like riding a bike. You never forget. And it's also been amusing. I have a staff and I like working with them very much. They are happy. That makes me happy. And like my old boss Mr. Warhol, I do believe that business can be an art. Going to the office daily has made it far more interesting when it comes to getting dressed in the morning. I visualize my day—the meetings I'm going to have, whatever business lunch or drinks might be on the schedule, and whatever tasks I might have to perform. Mostly I have worn a suit. I'm figuring Fridays are good for sport jackets. Today I met with writers, so I wore Supreme jeans, an old Issey Miyake striped shirt with a vertical breast pocket, and a stretchy jersey blazer from Freemans with a shawl collar. I looked just the right amount of haute and just the right amount of bohemian. Tomorrow I have a serious meeting. I plan to wear a dark gray wool suit and a sober tie. When you're going to fire someone, I say wear black shoes and belt. A white shirt is good. If you're going to wear something in your pocket, make it linen in case tears erupt. When you're going to balance the budget and influence the numbers people, checks are good. Wear black or blue, not red. 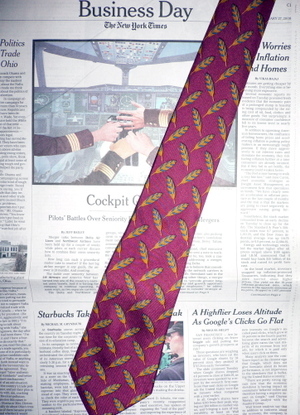 But here's the perfect tie for impressing a CFO or banker. It has balance sheet written all over it. And how about a Thom Browne Brooks Brothers Black Fleece pinstripe wool three-button suit to top things off? Black Fleece has been a brilliant moment. Radical conservative. I can't believe that Brooks hasn't signed Thom up for life. They'll never find a designer with a deeper connection to the essence of the brand, which is related to modernism. Part of leadership is projecting an image of realism. When the weather is changeable: Carry a raincoat and umbrella. Practicality begins at the top. Hats are still exotic in the business world. They are so out you don't even see them on Mad Men. It's important to project creativity. At least when you're a boss. I used to freelance as a creative in advertising and I'd get a kick out of showing up for work at a big agency wearing a beautiful suit, shirt, tie, and shoes, because I knew I'd be working with guys in rock-and-roll T-shirts and flip flops. They had such clichéd ideas of creativity. It was like growing a pinky fingernail long to prove you don't work with your hands. 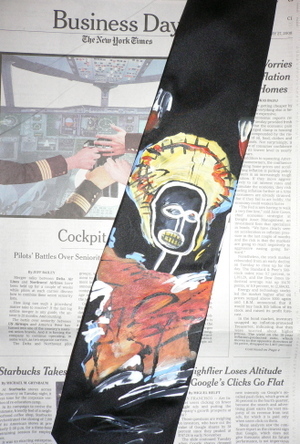 Real creatives can dress with zeal and complexity. I feel like I'm setting a tone here. When you're going to a photo shoot: Denim suit? Sport coat with jeans? Safari-jacket-type unconstructed cotton sport coat? Arty tie? For a heavy art-world day this seems like the perfect kind of tie—figurative but with a subtle chromatic palette. It's by Ralph Lauren. 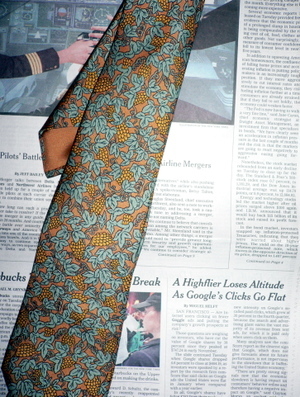 From Hermès, here's a perfect tie for getting some writing done. For those days when wisdom is required, you can combine it with a tweed jacket with elbow patches. Sometimes stealthy creativity is called for. I like wearing something that seems quite conservative on first impression and then becomes surprising or even mystifying on further examination. 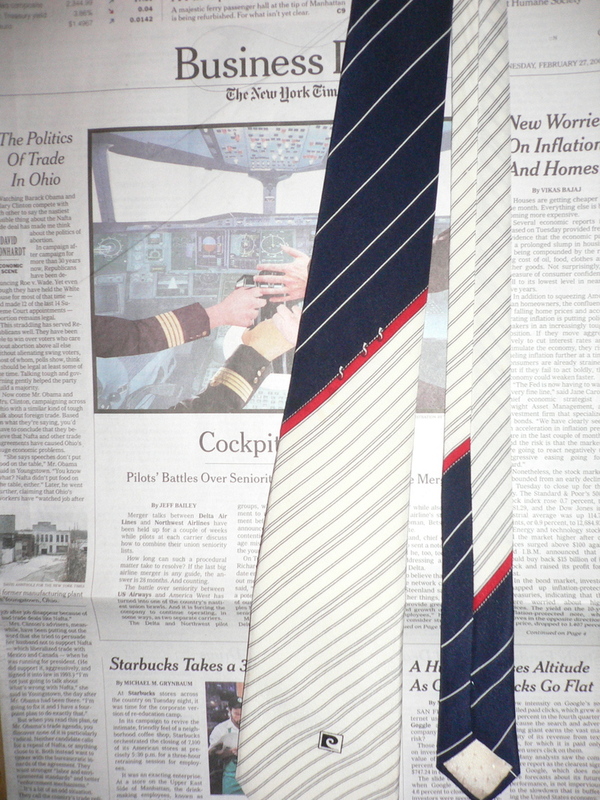 Here is a good example of a tie that works two ways. 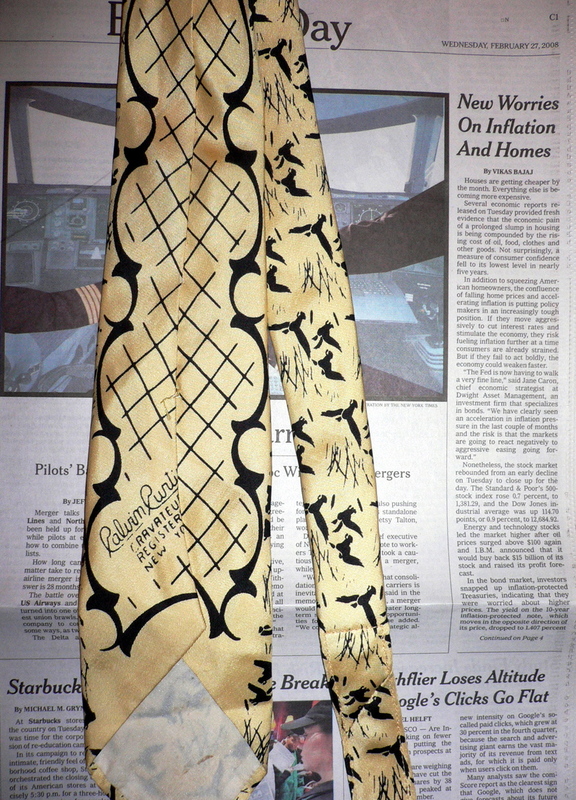 It's a hand-painted number from John Pearse of London. With one's jacket buttoned it looks quite conservative. But after cocktails, open the jacket to reveal the art of living. 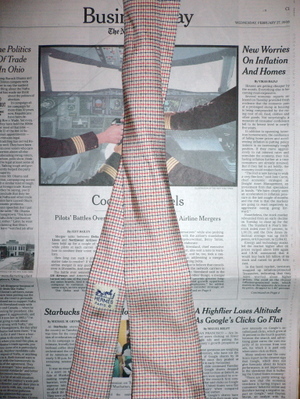 Suspenders can be employed in the same fashion, or socks. 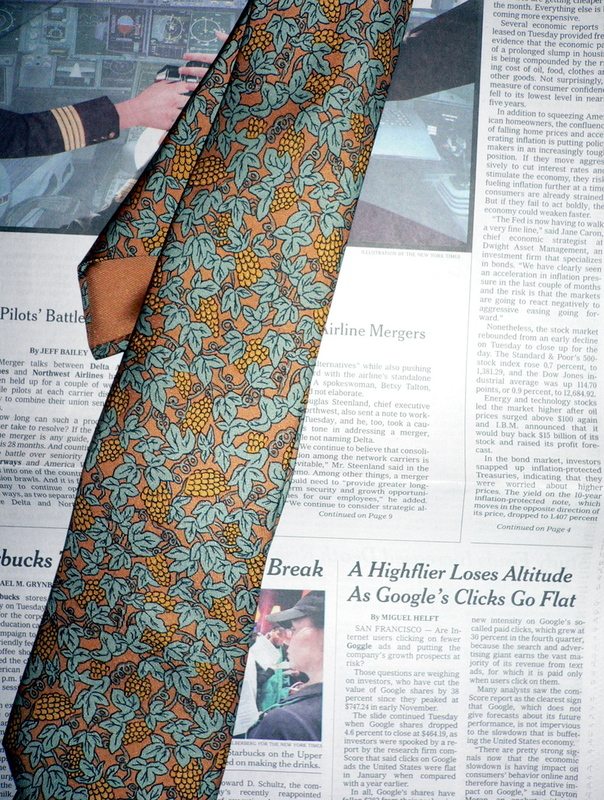 Here's a vintage Cardin tie that also permits a subtle usage that subverts expectations. We are at a very interesting point in American cultural history. 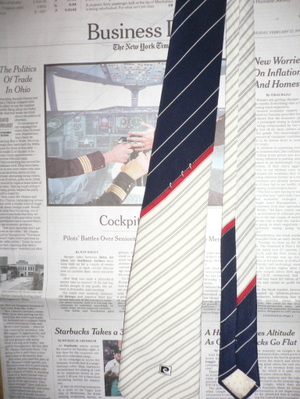 In many ways the work uniform has never been so rigid and boring—consider the flap Barack Obama has generated simply by not wearing the American flag lapel pin that has apparently become required by the Patriot Actors who dominate the political establishment. Obama is controversial simply by refraining from a rote cliché. I'll bet he has some stars-and-stripes underwear in his drawer. But his cool and composed appearance, like that of JFK, is showing us once again that thoughtful elegance can be a transcendent force in our culture. As I write this tomorrow is Friday. Spring training is underway. Nature is beginning to assert herself in subtle, seductive ways. I think I'll go with a sport jacket tomorrow. Suede shoes. 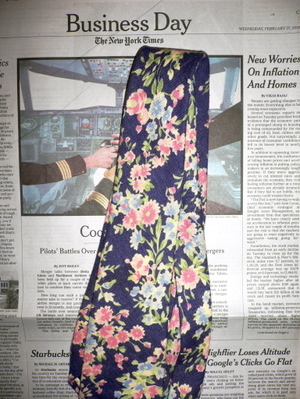 Blue end-on-end shirt. 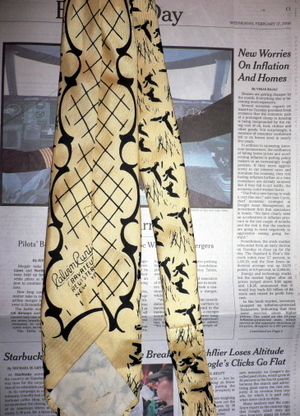 And maybe this vintage Calvin Curtis tie which has augury written all over it. Clothes are a language and we can use that language to lead our crews toward promising lands.